A comprehensive study of hundreds of galaxies observed by the Keck telescopes in Hawaii and NASA’s Hubble Space Telescope has revealed an unexpected pattern of change that extends back 8 billion years, or more than half the age of the universe. Today, star-forming galaxies take the form of orderly disk-shaped systems, such as the Andromeda Galaxy or the Milky Way, where rotation dominates over other internal motions. The most distant blue galaxies in the study tend to be very different, exhibiting disorganized motions in multiple directions. There is a steady shift toward greater organization to the present time as the disorganized motions dissipate and rotation speeds increase. These galaxies are gradually settling into well-behaved disks. Blue galaxies — their color indicates stars are forming within them — show less disorganized motions and ever-faster rotation speeds the closer they are observed to the present. This trend holds true for galaxies of all masses, but the most massive systems always show the highest level of organization. Researchers say the distant blue galaxies they studied are gradually transforming into rotating disk galaxies like our own Milky Way. Rather than limit their sample to certain galaxy types, the researchers instead looked at all galaxies with emission lines bright enough to be used for determining internal motions. Emission lines are the discrete wavelengths of radiation characteristically emitted by the gas within a galaxy. They are revealed when a galaxy’s light is separated into its component colors. These emission lines also carry information about the galaxy’s internal motions and distance. This cosmological simulation follows the development of a single disk galaxy over about 13.5 billion years, from shortly after the Big Bang to the present time. Colors indicate old stars (red), young stars (white and bright blue) and the distribution of gas density (pale blue); the view is 300,000 light-years across. The simulation ran on the Pleiades supercomputer at NASA’s Ames Research Center in Moffett Field, Calif., and required about 1 million CPU hours. It assumes a universe dominated by dark energy and dark matter. Credit: F. Governato and T. Quinn (Univ. of Washington), A. Brooks (Univ. of Wisconsin, Madison), and J. Wadsley (McMaster Univ.). The team studied a sample of 544 blue galaxies from the Deep Extragalactic Evolutionary Probe 2 (DEEP2) Redshift Survey, a project that employs Hubble and the twin 10-meter telescopes at the W. M. Keck Observatory in Hawaii. Located between 2 billion and 8 billion light-years away, the galaxies have stellar masses ranging from about 0.3 percent to 100 percent of the mass of our home galaxy. A paper describing these findings will be published Oct. 20 in The Astrophysical Journal. 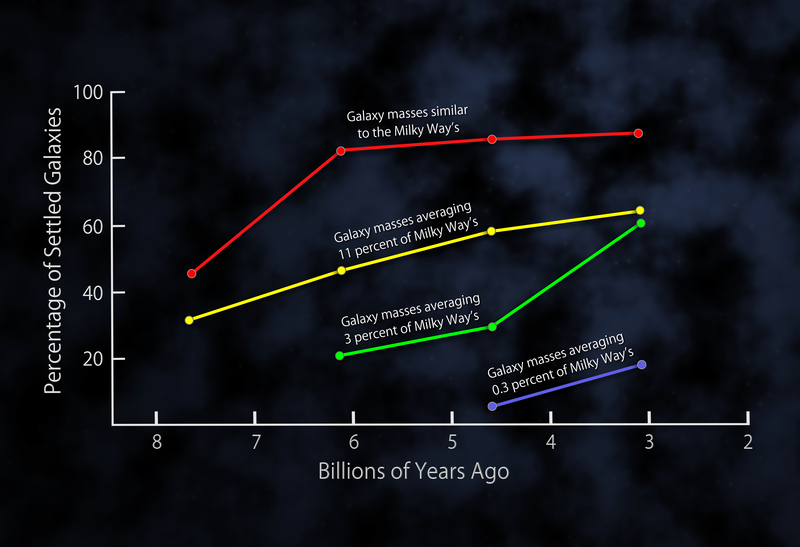 The Milky Way galaxy must have gone through the same rough-and-tumble evolution as the galaxies in the DEEP2 sample, and gradually settled into its present state as the sun and solar system were being formed. In the past 8 billion years, the number of mergers between galaxies large and small has decreased sharply. So has the overall rate of star formation and disruptions of supernova explosions associated with star formation. Scientists speculate these factors may play a role in creating the evolutionary trend they observe. Now that astronomers see this pattern, they can adjust computer simulations of galaxy evolution until these models are able to replicate the observed trend. This will guide scientists to the physical processes most responsible for it. The DEEP2 survey is led by Lick Observatory at the University of California at Santa Cruz in collaboration with the University of California at Berkeley, the University of Hawaii at Manoa, Johns Hopkins University in Baltimore, Md., the University of Chicago and the California Institute of Technology in Pasadena. The Hubble Space Telescope is a project of international cooperation between NASA and the European Space Agency. 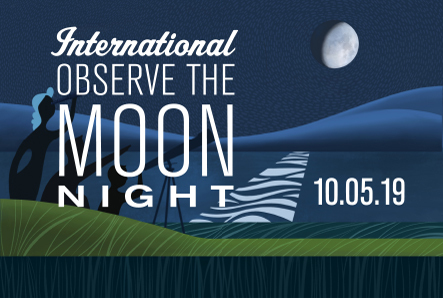 NASA’s Goddard Space Flight Center in Greenbelt, Md., manages the telescope. The Space Telescope Science Institute (STScI) in Baltimore, Md., conducts Hubble science operations. STScI is operated by the Association of Universities for Research in Astronomy, Inc. in Washington. 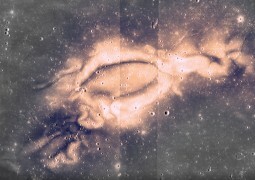 SSERVI researchers find lunar swirls could be the result of solar wind interactions with the Moon’s isolated pockets of magnetic field.